While Google continues to be the most popular search engine in the world (68% of the global market in 2016), more people these days are considering switching. There are many ethical concerns that arise with search engines, especially when they dominate the market like Google. All major search engines have censored certain sites, many restrict certain viewpoints from reaching their audience, and all denying access to free speech in one way or another. Recently, Google blocked 140,000 pages from NaturalNews.com, a popular alternative news site, from showing up in its searches. Many worry that with a search engine as powerful and all-encompassing as Google, little can be done to stop similar events from happening in the future, other than consumer pressure of course. Fortunately, there are a few sites that offer plenty of healthy competition, and show all of the results, allowing their users to receive the whole database of information – no censorship. One in particular site also has a unique mission behind it. While one can search for alternative news without worrying about some sites being censored, this search engine also plants trees. Ecosia.org is a small business founded in Germany in December 2009. Their mission is to empower other people to do good in the world – and most importantly to fight deforestation. “We believe in everyone’s power to do good,” – states their tagline. -Think big and prioritize what will have the greatest impact. -Be honest, authentic and open. -Seek long term, sustainable solutions. -Lead the way to a sustainable future. -Make it an enjoyable ride. It’s also an excellent way to support the environment – and all you have to do is search. “Trees mean a happy environment, healthy people and a strong economy,” – states the Ecosia web site. Ecosia is an eco-friendly search engine, a small business run by a team of people, who fight deforestation. Created in 2009, it won multiple awards by 2011. In November 2014, it planted one million trees that were funded by its ads. Its current goal is one billion trees by 2020, and the goal is very reachable. The Ecosia team is very transparent about their earnings and money spent on trees. All the monthly reports can be viewed on the site at any time. For example, in December 2016 Ecosia’s income was 276,935 euro. Out of the total, 31% went to operating costs such as salaries for its 21 employees, 10% went to marketing, 10% saved for financial stability, and the majority or 49% was spent on planting trees. This financed 341,379 trees that went directly to Indonesia, and Madagascar, and 110,000 euro also was set aside for the Tree Planting Fund. Today Ecosia is used by over 3 million users. To this day, it has financed 6,779,677 trees (the number grows every 11 seconds!) with over 2,85,663 euro used. 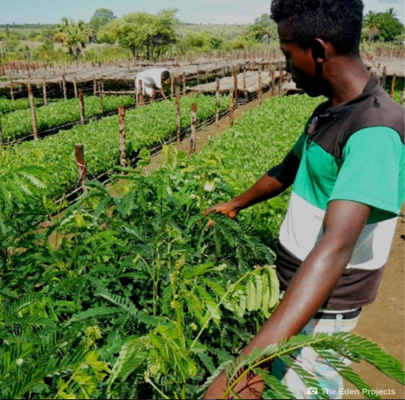 These trees were planted in local villages next to the Sahara desert, Peru, Madagascar, and Indonesia (even planting alternatives to palm oil). How Can I Use Ecosia to Help Plant Trees? 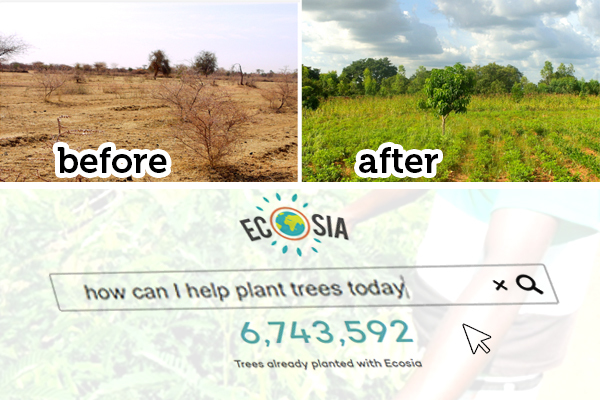 All you need to do to help Ecosia plant more trees is use the search engine as much as possible. The site is very user friendly, and looks clean and concise. It looks similar to Google, but in the right upper corner, there is a counter that makes it unique. A little tree shows how many trees you have helped plant. To make it easier to search, you can make Ecosia your default search engine by adding it to Firefox, Google Chrome, or Internet Explorer. You can also download it on Android and Apple products. Tags: best alternative search system, best search system, eco conscious search system, ecosia plants trees, ecosia vs google, ethical search system, Ethical shopping guide to search engines, Google alternative, google blacklisted natural news, green search engine, help plant trees, how does ecosia work, how to fight deforestation, How to stop using Google, make ecosia default search engine, search engine that plants trees, Search Engines and Ethics, and Unavoidable Ethical Questions about Search Engines.